Vintage from Paul is delighted to offer these Water Pitchers. The Colony Glass American Whitehall Water Pitcher stands 8-3/8 inches in height and it has a 52 fluid ounce capacity. 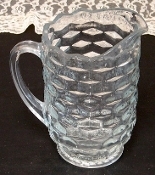 Each of the available Colony Glass American Whitehall Clear Water Pitcher is in Mint condition with no defects noted.